Exercise your Voice, your Choice, and Empower your Body! Non-Verbal, Verbal, and Physical techniques will be taught by Marla BB, 3rd degree Black Belt & nationally touring Blues/Rock Singer. The class will culminate in board breaks by all! Marla BB teaches Self-Defense at Holyoke Community College, Shelburne Falls Yoga, Girls Inc., Spirit of the Heart Martial Arts & Self-Defense Center, and the surrounding community. Contact Marla BB for Schedules and Fees. Self Defense students from Holyoke Community College breaking through their boards & barriers! Marla BB is Head Instructor/Owner of Marla BB's Tae Kwon Do Studio, at Universal Gym in downtown Northampton, MA; Professor of Self Defense at Holyoke Community and Smith Colleges; Workshop Leader at Mt. 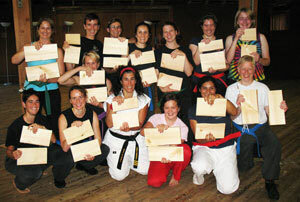 Holyoke and Hampshire Colleges; a Trainer at the National Women's Martial Arts Federation "Special Training" Camps and the Pacific Association of Women Martial Artists Camps. Ms. BB has also taught Teen Violence Prevention & Empowerment Classes locally at the Florence Learning Center Alternative High School, and Smith Vocational & Agricultural High School. Marla BB was founder of the Women's Black Belt Club "East" of Western Massachusetts and producer of Free Yourself! "An Evening of Martial Arts and Music" in a citywide fundraiser for Safe Passages - a battered women's shelter, at the Northampton Center for the Arts.